Splish Splash it’s a Beach Bash. Let’s bring the sun to the ice! 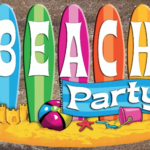 Help us Celebrate the end of the season and all the accomplishments of our athletes with a Beach Party, on our final day so skating Sunday March 26 and Wed. March 29. Let’s pull out our shorts and tanks! We invite child to get into the summer spirit and have some fun, by dressing in their summer gear, over warmer clothes ie. shorts over snow pants, sunglasses and hats fastened to helmets….we can’t wait to see summer around the corner. Please be sure that children are able to move safely on the ice in their costume. Report cards will be sent out in the mail for those that are not able to attend the last day. ** 10am Power Skating on Sunday, will have a regular scheduled class, with a little fun and shenanigans! No costume required. We would like to Thank-you for helping us create a positive and rewarding learning environment for your children. We are so very proud of the accomplishment of our skaters this season. Each athlete has worked hard and challenged themselves to obtain new skills. Well Done! We look forward to seeing everyone back on the ice for 2017/2018 Season. Watch for Online registration details in September.